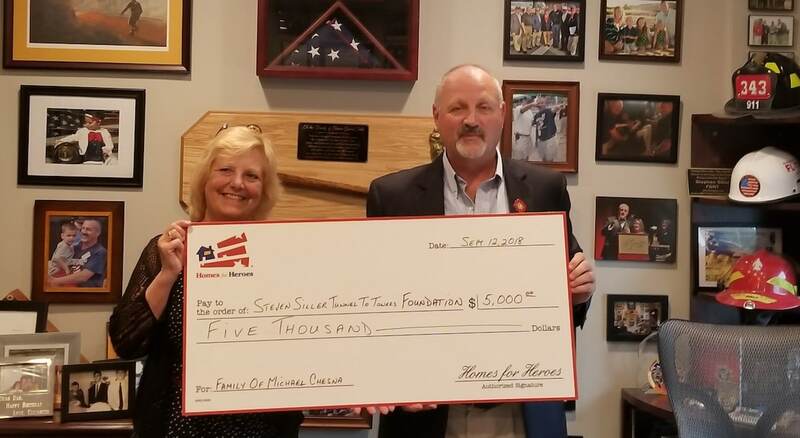 To support the family of officer Michael Chesna of the Weymouth Massachusetts Police Department, the Homes for Heroes Foundation provided the Chesna family with a $5,000 grant through the Stephen Siller Tunnel to Towers Foundation to help a first responder family pay off their mortgage and other expenses. As we remember the tragic events of 9/11 this month, we are honored to partner with the Tunnel to Towers Foundation to support Michael Chesna’s wife, Cindy (shown holding check with brother-in-law, Captain Comperchio of the Weymouth Police Department) and Michael’s two children. The Homes for Heroes Foundation, who provides grant money to local and national hero nonprofits to help support heroes who are in need of housing or emergency financial assistance, got to work and answered the call. With the help of Homes for Heroes local real estate specialists, CindiLee McTiernan and Joyce Powers, and the Tunnel to Towers Foundation, a Homes for Heroes Foundation grant in the amount of $5,000 helped to pay off fallen officer, Michael Chesna’s family mortgage and other expenses as reported by CBS Boston, channel 4 WBZTV on August 23, 2018. The $5,000 grant was one of many donations made to the Tunnel to Towers Foundation that assisted the Chesna family. The Homes for Heroes Foundation found a great charitable nonprofit partner in the Stephen Siller Tunnel to Towers Foundation, and their Fallen First Responder Home Program which is dedicated to helping fallen first responder families. Stephen Siller is one name to come out of the tragedies of 9/11 that resonates commitment to serving others, and Stephen’s siblings continue to honor his name through the Tunnel to Towers Foundation. On September 11, 2001, Stephen, was assigned to Brooklyn’s Squad 1 and heard the scanner report a plane hitting the North Tower of the World Trade Center. Upon hearing the news, he returned to Squad 1 to get his gear, and drove his truck to the entrance of the Brooklyn Battery Tunnel. The tunnel had already been closed for security purposes, so he strapped 60 lbs. of gear to his back, and raced on foot through the tunnel to the Twin Towers. Stephen gave up his life while saving others that day. The Tunnel to Towers Foundation, and the Siller family, are committed to ensuring we never forget the events of 9/11, the sacrifices made, and those that continue to be made by our first responders in the line of duty. Through the Fallen First Responder Home Program, they support law enforcement, firefighters, and emergency workers that lost their lives under extraordinary circumstances in the line of duty. It is their mission to provide a support system for the surviving families. 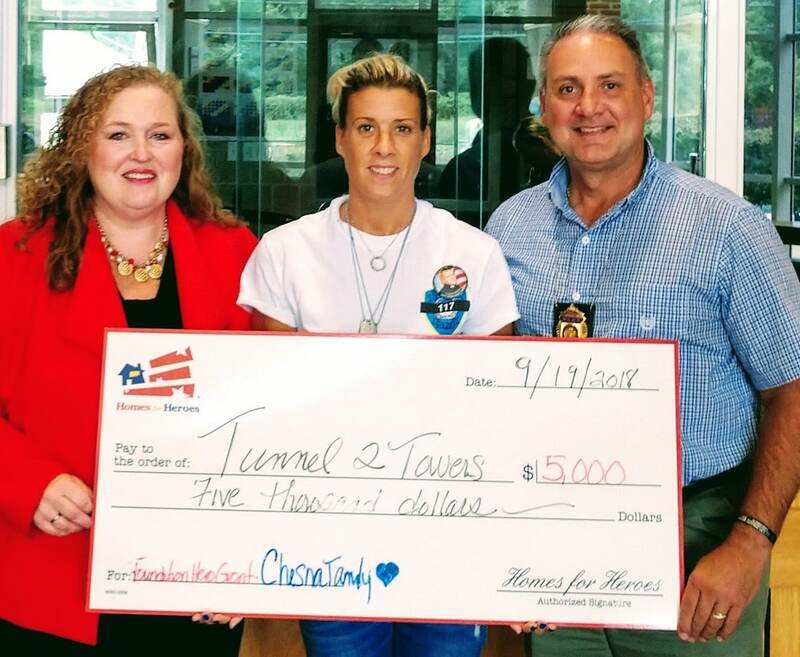 Since 2014, Tunnel to Towers has provided over $7,000,000 to help the families of fallen first responders, including the family of Michale Chesna. Funds have paid off the mortgages on their family homes or set up trusts for their children to help with education, medical and housing needs. Tunnel to Towers hosts an annual 5K Run/Walk every year in New York City to honor the sacrifice of firefighter, Stephen Siller, but also our military and first responders who continue to make the ultimate sacrifice for our country. Homes for Heroes, Inc., donates a portion of its earnings to the Homes for Heroes Foundation. Every time a hero buys or sells a home using the Homes for Heroes program, they are helping heroes in need as it pertains to housing or emergency financial assistance. Homes for Heroes, Inc., has also committed to covering all Foundation expenses. That means that 100% of your donation will be used to help heroes. DONATE to the Homes for Heroes Foundation to help heroes in need of housing or emergency financial assistance. LEARN MORE about Homes for Heroes, how they save American heroes money on a home, AND also support the Homes for Heroes Foundation mission.